Over the years these sheep were bred up to the tall, long, and lean sheep of today's modern Southdowns. Pockets of the original small Southdowns were rediscovered scattered on small farms around the country and were again of interest to people who have the desire to have a few farm animals as pets or for market, without having to have a large barn, large acreage and the strength to handle regular-sized sheep. To distinguish these small old original type of Southdown from the large modern Southdown, they were renamed Babydoll Southdown Sheep. My Babydoll Southdowns are the cute chunky type of Southdown that were shown as market lambs in the 1960's. They are an intelligent, quiet, and docile breed which tame down easily. With a little attention they will come when called and walk on a leash. They are personable, interactive, and have cute little old men cinnamon or gray faces with smirky smiles! Of all the miniature breeds of sheep, the Babydoll Southdowns are by far the most personable and docile. My sheep are 19-23 " tall and we have not had to do a c-section yet! I have not had foot rot or Caesous Lymphadenitis (abscesses) in my flock, both which are a problem in the breed in some flocks. My flock consists of sheep of the original color, off white with cinnamon or grayish faces and legs. I participate in the Voluntary Scrapie Eradication program - which allows me to ship sheep over state lines. Meat: These old type of Southdowns were originally a premium market lamb so they also have a small, flavorful marketable carcass should you desire to raise a lamb for the freezer. Wool: Babydoll Southdowns also have a short staple but fine fleece if you are interested in spinning or wool craft. Pets: Wethers, (neutered rams), make excellent, even-tempered pets, and many people prefer to keep a couple wethers for pets. For the person who has a small acreage and wants a few pet sheep on their place, they are an easy to handle, cute, and personable. Intact ewes and rams can be shown in 4H fairs and make excellent show prospects for the younger 4H'er. As do any sheep, Babydolls require yearly shearing, yearly CD &T vaccinations, seasonal deworming and free choice sheep salt mineral. They are easy keepers and require only grass or good quality hay and a sheep salt mineral for maintenance. They require grain only when lactating. Babydolls breed in the fall and lamb in the spring. For the person interested in breeding, breeding projects take quite a bit of work. To do it well and successfully you must learn the ins and out of raising sheep. Call your extension agent and order a copy of the SID sheep management book to familiarize your self with sheep, lamb management, nutrition, diseases and reproductive management. To have a successful breeding program and lamb market you must have the time and be willing to deal with advertising nationally, sending packets of information to people and the hassles of air shipping. I would like to think that my lambs are going to people who will take the time to learn about sheep care and are prepared to be good responsible owners for the life of the animal. There seems to be a steady demand for these cute sheep at the current prices. My sheep are all registered with the North American Babydoll Southdown Sheep registry. I am a stickler for health and soundness. I breed for good conformation, good muscling, good mothering instincts and easy lambing. I use a couple of unrelated rams so I usually have unrelated breeding pairs available as well. I refuse to breed runts to runts to produce scrawny, tiny and unthrifty lambs as some people have done to get their sheep tiny and smaller than the breed standard. 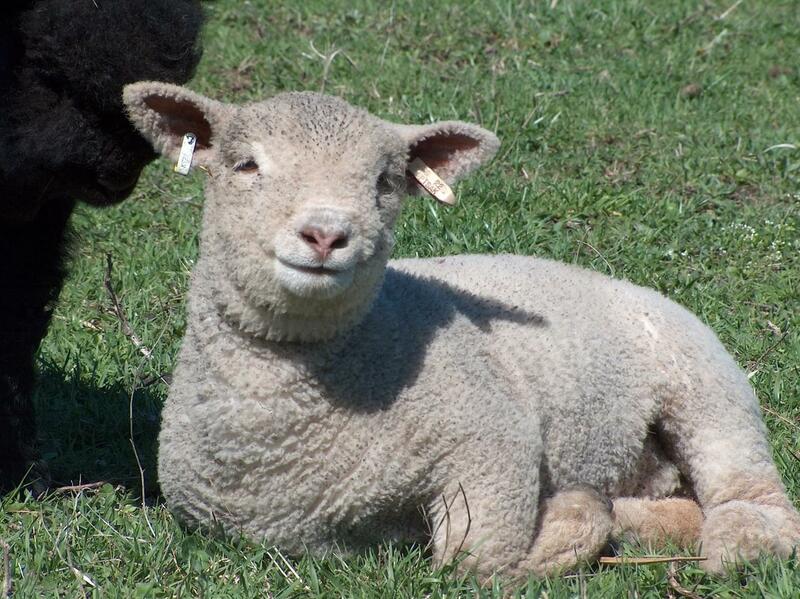 I like a nice small chunky lamb with good conformation and pleasant characteristics. Prices are $180 for an off-white wether (neutered male), and $600 for breed and show quality traditional off-white colored rams and ewes. All lambs sold as breed quality will be of good quality, with good sound conformation, and breed type. Cross country ground shipping is available through third parties via U-SHIP or other cross country livestock haulers and sometimes by air. I require a minimum $100 non-refundable deposit per head to reserve lambs for next Spring. The deposit is refundable if I am unable to provide any part of your order. I have been a breeder of sheep since 1965. I am proud of the quality of my flock and love to talk sheep. I usually start lambing in March. If you are interested in purchasing some lambs please get in touch with me early!